T.E.S. Construction Inc. started out in just new construction framing and half of our business is still framing. T.E.S. is experienced with single and multi family dwellings and also commercial. T.E.S. has also been doing wall panel installations for these dwellings. General Contractors appreciate our reliability, attention to detail and responsiveness to change orders and warranty issues. No less significant we go to great lengths to keep the customer - the homeowner - happy. The real benchmark of our services is the quality craftsmanship that we put into every job. 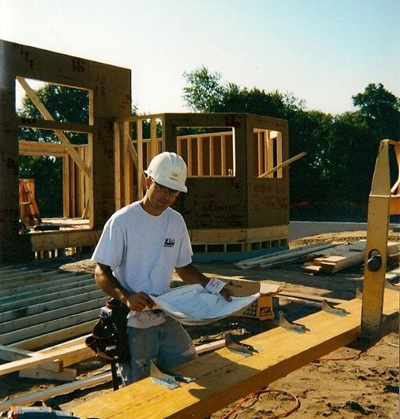 Each of our professional carpenters takes pride in the work that they do and work on every home as if it's their own. Our Field Supervisors follow a detailed checklist to ensure that every job meets T.E.S. 's high standards for quality and every carpenter takes extra care to keep job sites clean and organized. All of our crews are equipped with generators, air compressors and forklifts. Additionally, each crew has a company vehicle and each Field Supervisor carries a cellular phone for easy communication with Job Supervisors and the office. Equally important is that our carpenters receive on the job training in carpentry, forklift operation and safety.